The Pinellas Trail serpentines through many perspectives of Florida's development. 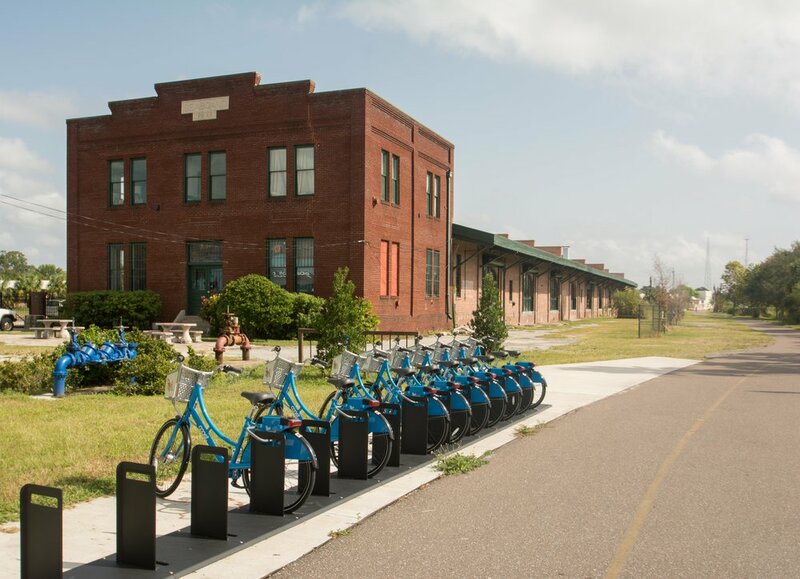 Located on nearly forty miles of repurposed railroad tracts in Southwest Florida, the trail passes through the heart of downtown St. Petersburg and its dense, walkable streets, popular breweries, coffee shops and offices. Further north along the trail brings a different experience: intimidating pedestrian bridges towering above massive intersections and seas of parking lots. Even in downtown, where concerted efforts to build a holistic mobility experience have resulted in buffered cycle tracks and wide sidewalks, some infrastructure suggests that cars are welcome and people are not. The highway tears through the downtown edge and provides shaded parking for cars, but does little to enhance the pedestrian experience. In regions where shade is coveted, the highway underbelly could be a tool for much more than parked cars. Miami, for instance, is transforming 10 miles of land below an elevated rail line into a linear park. Don't own a bike? Coast, the city's bike share program, has people covered with stations along the trail and throughout the city. While downtown has begun to integrate the trail into its growing cycling network, St. Pete's suburban outskirts do not seem to be capitalizing on the existing bike/ped infrastructure. 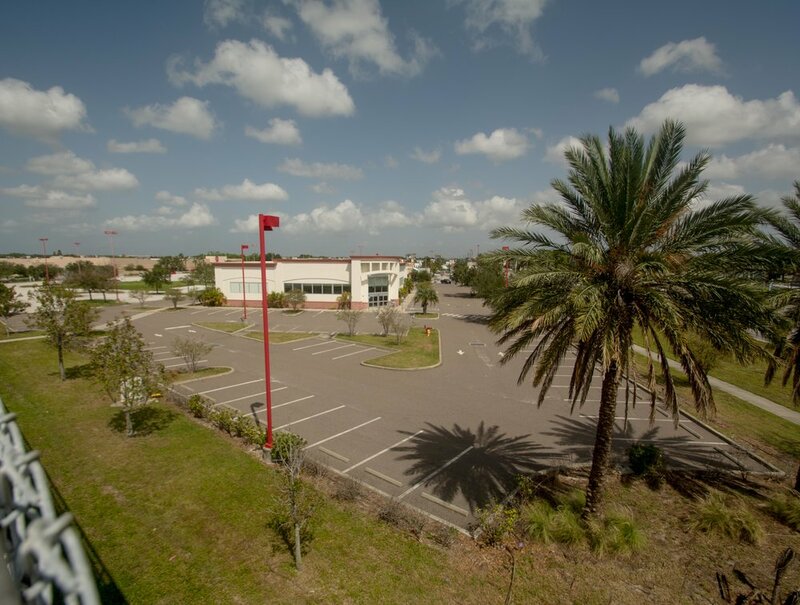 Much of the suburban landscape is comprised of six-lane roads and big box stores with vast parking lots. When riding on two wheels, it’s even more staggering how much land is dedicated towards parking cars—even though demand does not seem to justify the supply. During the middle of a weekend, parking lot after parking lot adjacent to the trail stood empty. Another detriment of suburban sprawl is the proliferation of impermeable surfaces. In a place as wet as Florida, an excellent job has been done of impeding nature's water cycle. As the downtown portions of the trail show, land in the suburban realm could be used more efficiently. Instead of catering to car traffic, shops could orient entrances and quality bike storage towards the trail. Infrastructure and design that prioritizes alternative mobility options also helps save on costs. Pedestrian bridges, like one of the many on the Pinellas Trail that spans ten travel lanes, aren’t cheap—or necessarily pleasant. A well-intentioned effort to keep riders safe, the bridges themselves sometimes feel equally as daunting as the intersections they span. Neither is stormwater management, which would be less of a burden to manage if we didn’t allow for the proliferation of pavement. The Pinellas Trail provides multimodal connection across an entire peninsula on the west coast of Florida. It offers a safe way for families to enjoy a weekend ride, for friends to catch up on a walk, for neighbors to soak in the Florida sun. However, the trail has much more potential to shape the mobility options in Pinellas County. As the downtown region shows, people will only embrace utility cycling—cycling for transport rather than leisure—when they feel just as safe biking off the trail.